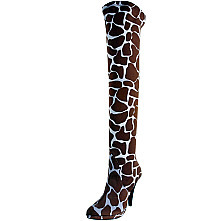 You will certainly walk in the wild side with this sharp above the knee giraffe boot by Two Lips! This boot will exceed your expectations! It has a great style, it is very comfortable, and you can wear them with a lot of different outfits. It looks great with jeans, leggings, skirts and dresses. Be prepared to get a lot of compliments, and you will try to find many occasions to wear it.